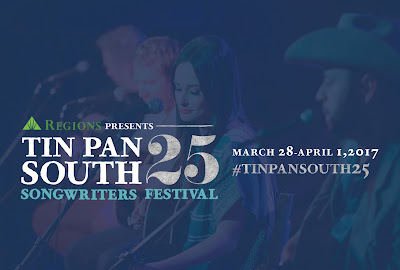 The popular Tin Pan South Songwriters Festival turns 25 next year, and dates have been set for March 28 - April 1, 2017. Regions Bank returns for the tenth year as the presenting sponsor of the event. In addition, the world's largest not-for-profit songwriters trade association Nashville Songwriters Association International (NSAI) turns 50, and the NSAI-owned Bluebird Cafe celebrates 35 years of providing an iconic stage for songwriters next year. Produced by NSAI, Tin Pan South reigns as the world's largest all-songwriter festival. This year, over 350 talented songwriters performed 92 shows at 10 of Nashville's top music venues. Thousands of music fans attend the event annually to hear writers tell stories behind hit songs they have written and perform those songs as they were originally composed.